As it stands right now, T-Mobile is the only major U.S. carrier without the iPhone in its line-up. However, if you think that there's much uneasiness over at T-Mo world because of that, it might be worth it to see the carrier's point of view: T-Mobile is firmly convinced that it has all the firepower needed to match its competitors, and even beat them. How does it plan to achieve that? Through Android and smart pricing. Being the first carrier to launch an Android phone in the world, T-Mobile clearly recognizes the great potential that's found inside Google's mobile OS. 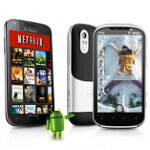 The carrier has been steadily building a robust portfolio of Android handsets, designed for pockets of different sizes. Among the most stand-out products in its catalog are the marvelous Samsung Galaxy S II - the people's champion, so to speak, and the HTC Amaze 4G. As you can imagine, both smartphones feature incredibly large screens, super-snappy dual-core processors and connectivity to T-Mobile's 4G HSPA+ network - all of which are features that make them fully capable of going toe-to-toe with the latest iPhone. Besides, there are many other Android handsets available with the carrier, all meant for different types of customers and catering to different needs (big/small, premium/affordable, with QWERTY/without QWERTY). This combination of choice, together with the great personalization options of Android, is what T-Mobile says makes its portfolio better than simply carrying the iPhone. Speaking of its HSPA+ network, we should mention that T-Mobile follows the "one size doesn't fit all" approach here as well. The carrier has a wide range of both individual and family plans, which you can personalize via various minute, text and data bundles. And if you need to get two new lines, you can do so with T-Mo throwing in unlimited talk, text and data for only $49.99 per line - a nice service plan to complement your powerful Android phone. However, you'll definitely have to lay some more cash for a plan if you want to get, say, an iPhone 4S on some of the other carriers. This is a nice example of how T-Mobile competes through a flexible portfolio of hardware and service products. So, these are the main weapons in T-Mobile's arsenal against its rivals and the iPhone right now - a great choice of Android phones and affordable data plans to go with them. Now it's your turn to tell us if you are content with what you see in Magenta's line-up! Is there something that you'd like to see added? Sound off in the comments below! ya i feel the same way. i might switch AWAY from verizon now that they have the iphone. I think Verizon did feel the same way......when they didn't have the iPhone. And the only thing better than having a wide selection of Android phones or just simply the iPhone is having a wide selection of Android phones AND the iPhone. Offering the iPhone straight up may probably make things easier for T-mobile and they do have a large demand for iPhone. If Apple offered T-mobile the opportunity, I don't think they'd deny it. I am a data consumer and I have tried many times to sign up with T-mobile and unfortunately T-mobile makes it very difficult for consumers like me to join the T-mobile family. For example, I could pay $30 a month and get 5 GB of data at 4G speed on a no-contract phone, however I am unable to get the same 5GB of data also at 4G speed for a mobile hotspot under a 2-year contract at said price, respectively. As a result, I see no reason to abandon my current mobile data provider and join the T-mobile family. Here is my point, if T-mobile can make 5 GB of 4G data available for $30 a month, why not make that across the board. 5 GB of 4G data is 5 GB of 4G data. Thank you. ardent, there is no major carrier that matches Tmobile's pricing, and for your information if you do the VALUE plan on Tmobile, it IS $30 a month for 5 gigs of usage for Tmobile customers. Tmobile gives a DISCOUNT on top of their already industry leading pricing to customers that also have voice service. So there, Your wish has been granted. Go to VZW, ATT, or even sprint, and ask them how much a 5 gig data card is. Verizon - $80 and they give you 20 GB at 4G. dude.. seriously, learn to read its 10 gig for $80 a month on VZW 4Ghttp://www.verizonwireless.com/b2c/plans/?page=mobileBroadband Tmobile value plans are 10 gig for $50 a month for 42mb/s 4G. Well, if you have an unlocked phone, you can tether to your heart's content without paying a tethering fee. Hopes that solves your dilemma. I agree wunhundra%. That is why I love T-mobile! so.. its bad of Tmobile to allow iphones on their network without bending over and being pipe cleaned by Apple first, like Sprint just did?? lol. Sounds like they are the SMART ones. Why give Apple your bank account when you already get their services for free? Your going to hate on the carrier that gives you your precious iphone on plans so cheap that ATT will never come close to them?? Yes, let me hate Tmobile for $30 unlimited 4g web and text or $50/60 unl everything with an unlocked iphone.. oooh no!! hoooow eeeeeevil of them to allow you to keep some money in your pocket and still get your favorite phone!!! lolol Yes, unlocked iphones are so common we have an iphone support team in customer service. welcome to gallito-land where logic is outlawed. Tmobile is the new napster. right! lol you know, because napster was where people went to illegally trade music they didnt pay for. Somehow buying a used iphone, or taking a phone you already paid for on ATT and moving it to another carrier is PIRATING IT ..lol. Gallito. you are a dunce of the highest calliber. But hey, thats why we lubs ya... or not. :) Arent you the same guy that continually tells us how high of a price a used iphone gets compared to an android phone?? WHO DO U THINK IS BUYING THOSE USED IPHONES?!?!?!? lolol your a riot. the most common reason people leave Tmo for another carrier? Coverage issue. I dont think iphone even makes the top 5. Why? Because its a GSM DEVICE. Unlike VZW and Sprint which have extreme lock downs on their devices and are not compatable with each other, ATT and Tmobile phones run GSM. A simple software unlock code unlocks it for ANY GSM Carrier. In europe they mostly buy unlocked phones then jump carriers at will. Tmobile is a european company.. amazing coincidence that they set up their plans and service to be similar. So, what your really saying is that Apple should sue everyone that buys an iphone unlocked.. even if its from apple.. right? Because, they didnt go through the carriers???? IS THAT what your saying?!?!?!? lololol You do know that APPLE sells iphones UNLOCKED from their STORES. Are they doing something wrong too?? Do you REALLY THINK APPLE CARES as long as they get paid?!?!? lolol Are you really not getting this ?? First you compare Tmobile to Napster, and now to Sprint. How about you figure out how to compare it to something that is relevant. I didnt have taco banned. Taco had himself banned... unless of course im the evil puppet master controlling what he types... then there was all of his fake accounts that he used to troll the boards under different names. I bet thats my fault too, right chickenhead? :) you are a riot today. must be O/Ding on fruit flavored punch. they are in the same league concering SPEED. I never said they were in the same league with coverage. NO ONE is. However, they have basically the same network as ATT at half the price and twice the speed, so why would you be on ATT?? Oh yea, you want an iphone. over paying up front, and every month. You just want everyone else to get financially ripped off the way you are. Sorry, some people are smart enough to get their cake AND eat it too. Agree with gallitoking. Many GSM iPhone Users are already on T-Mo. I personally love the freedom of changing phones via sim card. Always a plus when You're a phone geek. And price is definitely a MAJOR Point for Me. They are bring Nokia WP Right? They are adding Nokia WP to their portfolio right? Part of the merger failure break up fee is a 7 year roaming agreement on AT&T's 850/1900MHz HSPA+ network. Get an unlocked iPhone, get a free microSIM plus a great plan from T-Mobile, and basically you're back on AT&T for less $! Better yet, get a Galaxy Note and do the same thing! When does the new roaming aggrement take effect, was that announced yet?